Australia has some fantastic walking tracks all around the country. Whether you’re tempted by a coastal hike, a day in the rainforest or an outback adventure, they all offer something unique. We regularly recommend trying out various walks and immersing yourself in all the natural beauty that Australia has to offer. It doesn’t matter whether you call Australia home or if you’re visiting for a week or two this is one of the best ways to experience the country. Hiking tracks in Australia are generally well maintained, there’s good information available and they come in a wide variety of distance and difficulties to suit all walkers. They range from 500 metre paths to multi day trails and even the staggering 5,330 kilometre Bicentennial National Trail crossing four states and territories, the longest multi-use trail in the world. To make selecting your walk easier and to ensure it’s within the abilities of all members of your party there’s a consistent rating system now used across Australia. The system is voluntary but has been widely adopted for use within National Parks and many other tracks. 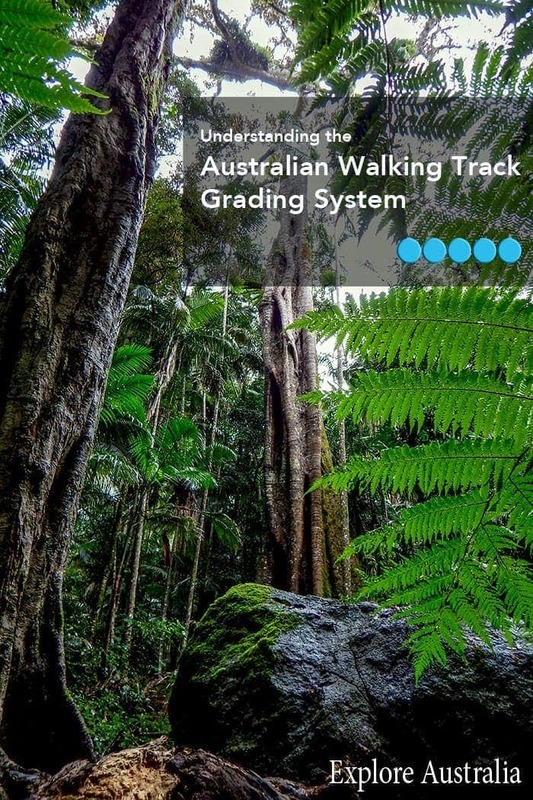 Known as the Australian Walking Track Grading System it gives an solid guide to the difficulty of the track. Here’s what that grade means when you are planning your trip. The trail will be under 5 kilometres and doesn’t require any bush walking experience. The track will be flat and even with no stairs or overly steep sections. To be rated a grade 1 the track should be suitable for people in wheelchairs (with assistance) and childrens’ strollers. A grade 2 track will be under 10 kilometres and like the grade 1 it doesn’t require any prior bush walking experience. These are great tracks to get started on. The track will have a hardened or compacted path and may include some gentle slopes and occasional steps. These tracks may be up to 20km long but you’ll find many under 5km. They are suitable for most ages and fitness levels but it’s suggested that you have some bush walking experience. The tracks are well formed and marked but may have short steep hill sections, steps and uneven ground. In parts there may be obstacles you need to go over or under. A grade 4 track is likely to be longer and include rough ground and very steep sections. These tracks are suggested for people with experience bush walking. They may be any length and directional signs and markers are likely to be more limited. A reasonable level of fitness and unrestricted movement will be required. These tracks are only for very experienced bush walkers with specialised skills and equipment including navigation, emergency first aid and climbing. The tracks are likely to be less defined, rough, steep and have very few directional signs or track markers. For the sake of the environment and your own safety walkers should stay on the marked tracks. It’s a huge country, the forest is very dense and it’s easy to become lost if you wander off the trail. One of Australia’s biggest attractions in my eyes is that it’s home to so much beautiful and unique wildlife but along with the cute, feathered and fluffy we’re home to 20 of the 25 most venomous snakes in the world. Then there’s the toxic insects and spiders, and various other wild animals that although generally harmless to humans will defend themselves if they feel threatened. While some of that might sound a bit intimidating being informed is the best precaution and there really is no reason to be afraid. Keep it in perspective. On average 1-2 people die each year in Australia from snake bites but 30,000 people die from gun shot wounds in the USA each year. I’m way more scared of people with guns than I am of snakes. As part of your preparation make sure you are properly equipped and dressed for the hike you are doing. A large part of Australia is very hot so make sure you carry adequate water, you’re body needs it even more while you’re exercising. Comfortable footwear that supports the ankles is essential and thick socks. Conventional wisdom is to always hike in long pants, this will give some level of protection from scratches, stings, ticks, leeches and yes, snake bites. Unfortunately I think I would pass out from the heat in the Queensland summer in long trousers, even lightweight hiking pants so I do wear shorts like many others. Having said that we haven’t hiked grade 5 tracks at this stage. Possibly the most important precaution is with insect repellent, not only can mosquitos make your hike quite unpleasant they’re also quite a risk in most parts of the world. With a friend currently suffering the effects of a mosquito born illness, from a bite obtained in a suburban area, I’m even more liberal with my application. While I understand the possible risks of DEET, and hate having it around my camera and binoculars, it’s the only thing that keeps the mosquitos and midges from coveting me during the rainy season. Finally as a precaution if you’re tackling a more remote or higher graded track it’s a good idea to let someone know where you’re going and when you’re expected back. If you’re on holiday you can always leave details at your accommodation. Having picked your location and having the information to choose the best walk for your experience and fitness level it’s time to get out there and experience some of this beautiful country. 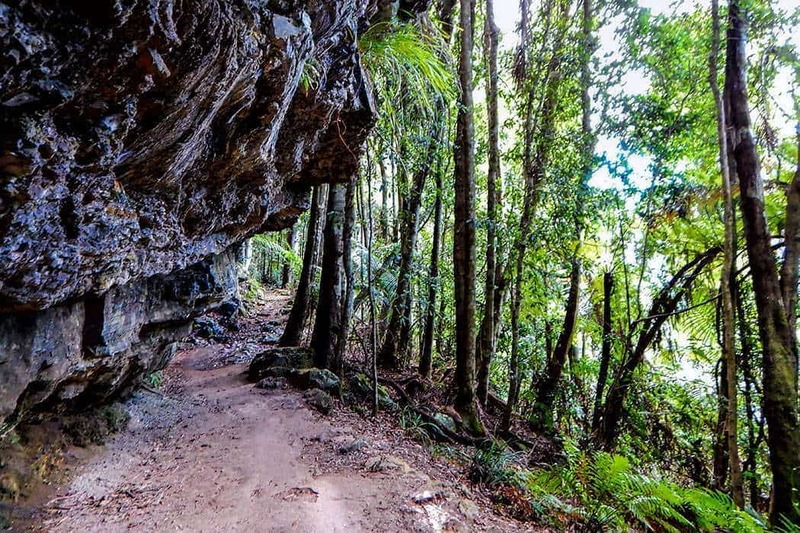 To get you started here are a couple of grade 3 walks easily accessible from the Gold Coast in Queensland that are well worth a try. We hope you enjoy exploring the best of Australia. If you’ve tried some of the National Park walks we’d love to hear your thoughts and recommendations in the comments below. I wish I had this guide when I was traveling Australia a few years ago – there are so many amazing trails and beautiful sights to see! The snake bites in Oz versus gun deaths in the US is a brilliant comparison. We spent 6 weeks in a remote Costa Rican jungle late last year. Fer de lanzes, eyelash vipers and other potentially dangerous snakes littered the place. But I felt safer there versus walking through my home town at night. Because the snakes don’t have a grudge, nor access to firearms 😉 Just protecting themselves while gun toting folks usually have some nasty motivators to pulling the trigger. Thanks for the cool read! Thanks Ryan, Costa Rica must have been fabulous! Very useful post and great idea to have this system! I’ve learned something new today! 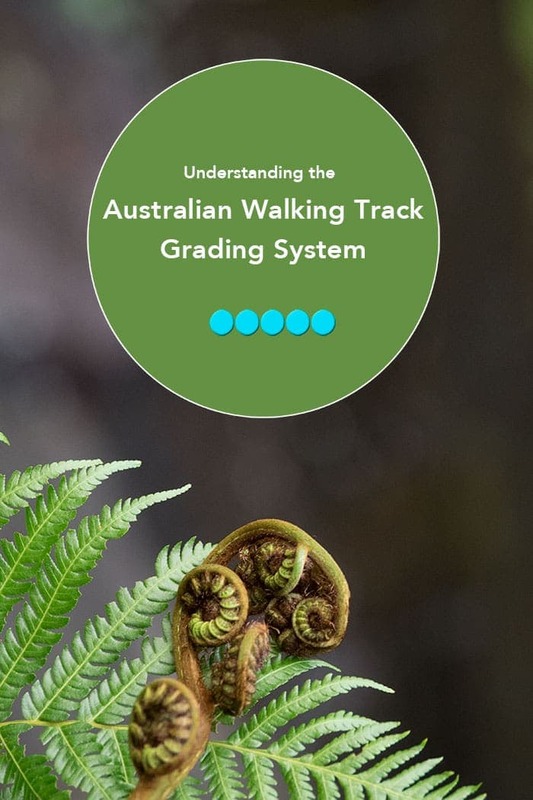 I honestly had no idea about the walking track grading system, even though we’ve been hiking around Aus since I was born!! Thanks Toni! You’re young, fit and familiar with the landscape and risks so it’s much less of an issue but I do still find it useful especially as the length of the track and difficulty rating aren’t always correlated. Great tips! Especially the types (grades) of the hikes and safety issues… Trekking and hiking are such an amazing way to discover the country, and Australia is so rich in fauna and flora. I’m not sure if I would have courage enough to go on the trails by myself, but I totally do a guided walking on a grade 3 trail. I had no idea about the grading system, so I’m glad that I was able to find so many useful information in your article and at the same time you opened my appetite for walking trails. I also checked the 3 options you suggested for walks and I loved the Twin Falls Circuit. Yes, somehow when I think about Australia, I think how many deadly things you’ve got there, but you’re right about the right perspective – there are many more dangerous things in the world and safety is important to consider before you set off. As a wheelchair user, I really like that this grading system is in place. It’d certainly make it a lot easier for me to choose a trail that is doable. Super cool post, with plenty information. I’m starting to enjoy more and more walking trails. This grading system is super clear and you give wonderful tips, specially for those, like me, who are just starting. Australia must be an amazing place to walk around! A very informative article. The grading system really helps you decide which hiking path is for you. Thanks for the great tips. This is such a great idea. I remember I was a bit overwhelmed with the first hike I went on because there wasn’t any information like this available. Now however, a lot of places have some system in place to describe how difficult or easy the trail is. This seems a lot better that most of the other places though. Hi Phoebe, thank you! I can’t wait to see where you get to on your road trip, it sure is a huge and very beautiful country to explore. HI Jenny, we love New Zealands walking tracks too but don’t find them as easy to find information on although I’m sure that’s changing. It’s been a few years since we went hiking over there. I didn’t know about the grading system – this is really useful information! And yes, I’m paranoid about the mosquitos as well…too many friends have picked up really bizarre mosquito-borne viruses from bites.